Diamond Details: Round brilliant cut white diamonds of F color, VS2 clarity and excellent cut and brilliance weighing 7.60 carats total. Measurements: Approximately 16.25 inches in length not including the diamond drop at the center of the chain. 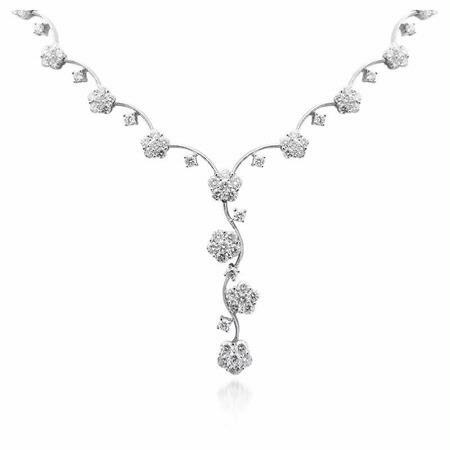 This absolutely stunning, Italian designed, 18k white gold necklace is alight with round brilliant cut white diamonds of F color, VS2 clarity and excellent cut and brilliance weighing 7.60 carats total. Inquire about the matching diamond bracelet to magnificently complement this diamond necklace. This diamond necklace measures approximately 16.25 inches in length not including the diamond drop at the center of the chain.